Something I’ve been pondering since the FinCon 17 last week: while the high-level “rules” of personal finance can be written on a single page, each of us has a slightly different approach to money. Our individual money approaches are colored by our upbringing, biases, interests, life goals, even our biochemical wiring. But, as we’ve previously written, every financially successful person follows one common principle: engagement. I would add “commitment” as the principal immediately following engagement. Commitment to an intentional financial life, regardless of goals, workflows, wealth, or income. “Until one is committed there is hesitancy, the chance to draw back, always ineffectiveness. Concerning all acts of initative or creation, there is one elementary truth…that the moment one definitely commits oneself, then Providence moves. too. 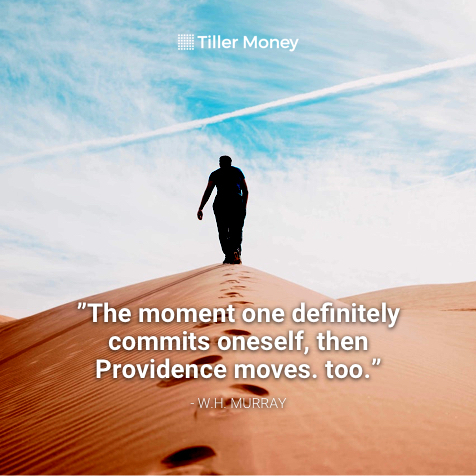 Committing to a financial path is one of the most important and transformational “acts of initiative” one can undertake.